I am taking a break from my Monday with Mounce blog until September. See you September 10th. When you read the Greek, are you reading the original? This question can be answered several ways, but this morning I am not interested in the issue of the faithfulness of the manuscript tradition to the original autographs. I am interested in the faithfulness of our modern Greek texts to the ancient Greek manuscripts we have. I was proofreading a statement I made in my textbook, Basics of Biblical Greek. In 8.13 I say, "The ν in the third singular ἐστίν is a movable nu, but ἐστί occurs only once in the New Testament (Acts 18:10)." This statement is true for NA27 (the 27th edition of the Nestle-Aland text) and UBS4, but in NA28/UBS5 it isn't true because the modern editors have standardized spellings. There are other examples of this, but ἐστί illustrates my point. Why do this? Have the manuscripts changed? Is this an issue of textual criticism? I don't think so, since there are standardizations of spellings elsewhere as well. This appears to be an overall decision of the editors of the Nestle/Aland. 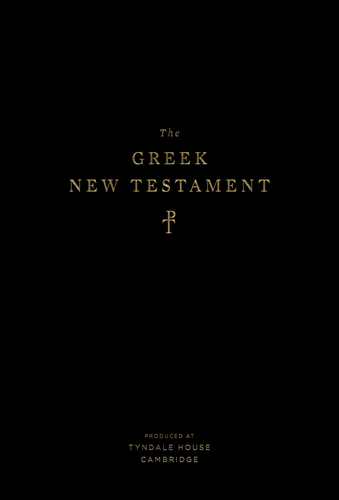 This is one reason why I am thankful for the new Tyndale House Greek New Testament. The vast majority of scholars agree that the earliest texts such as Sinaiticus and Vaticanus are the most reliable, so shouldn't our modern critical text follow them more closely, not just in what words are actually used but in things like spelling? See the Introduction to the Tyndale House text for a detailed discussion of their approach, pp. 508-12).